Jesus lived quite a while ago. In the meantime, we followers of Jesus have had ample opportunity to tell stories about him, put some spin on his life, and generally mold him into a leader who tells us to go exactly where we already are. Fortunately, we have the Bible, which contains four books of stories about his life, so that we can read those stories and bring ourselves back to who Jesus actually was. Or can we? So often pastors tell people to read their Bibles and believe what they read, to view the Bible as the instruction manual for life. That might have been a good enough metaphor while we were new to the faith, but a mature faith calls for a deeper understanding of the Bible. We have to acknowledge its history and treat it as the book that it is, not the book we want it to be. So let’s break down some of the idolatry that’s been built up around the Bible, so that we can break down the images of Jesus we construct for ourselves. The Bible was not handed to us by God. It was written over a period of about 1,000 years by people from a variety of countries, writing in a variety of languages, including Hebrew, Aramaic, and Greek. The stories they wrote down were, in many cases, handed down from generation to generation before being encoded in the written word. Once written down, scribes had to hand write copies of the texts, often in poor lighting conditions. Just like modern copy machines, when scribes made copies of copies, quality degraded. The result is that scholars have found many manuscripts containing the same texts, but with slight variations which have to be interpreted. Once we decide on a final manuscript, it has to be translated into English, which causes a number of issues. This is why we have many different versions of what is supposed to be one single Bible. What a strange way to end that parable! We think of Jesus as someone who wants everyone to be forgiven, but here he is quoting Isaiah, implying that he’s trying to hide the gospel truth from the crowds to which he’s speaking. To understand why Jesus wants this kept a secret, we have to understand where this quote comes from in the Bible – it’s the Gospel of Mark. Mark, in general, writes about Jesus wanting to keep his identity and purpose a secret from the public, something that theologians have called the “messianic secret”. So it’s unsurprising that Jesus would use parables to reveal his story, because parables illustrate truths without directly revealing them. Not everyone who hears a parable will find out what the parable means – only those who investigate, who look for the truth behind the story, will find its meaning. So it’s left to us to interpret this parable for ourselves. It’s a fairly straightforward parable, teaching us about four different types of soil. Only one of those types of soil yielded grain, and yielding grain is good, so we know that Jesus is asking us to think about the things that prevent growth and highlighting the importance of being “fertile soil”, whatever that might mean. This is the traditional explanation that has been handed down through the centuries. And, unlike many things handed down through church history, this has its roots in the Bible! But in the context of our discussion here, it’s very confusing. Jesus tells a parable explicitly for the purpose of concealing the truth, and then he promptly reveals the truth behind the parable to his disciples. In the context of Mark, it’s understandable because Jesus will reveal his identity to persons close to him: his disciples, people he heals, and other in direct contact with him. But he instructs these people to never reveal his identity to a wider audience, such as the great crowds gathered around to listen to Jesus’ parable. It reminds me of the Kryptos sculpture in front of CIA headquarters in Langley, Virginia. 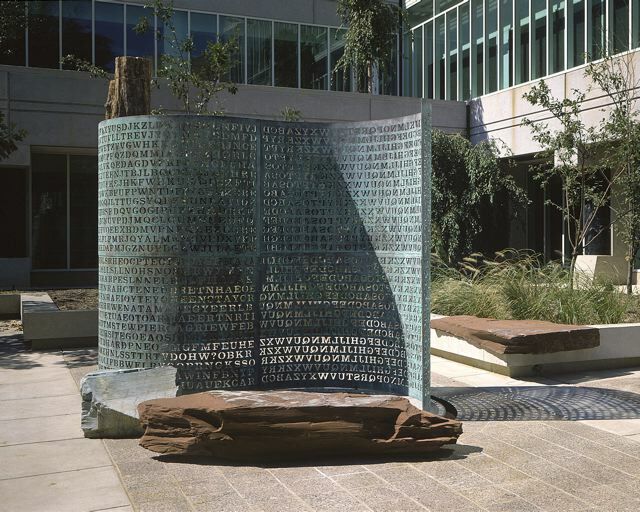 “Kryptos sculpture” by Jim Sanborn – Jim Sanborn. Licensed under CC BY-SA 3.0 via Wikimedia Commons. This sculpture is publicly displayed – anyone walking by can read it for themselves. But it contains a code. A code so difficult, in fact, that as of 2015, no one has finished cracking it – not even code crackers within the CIA! Jesus’ parables function in a similar way: they’re public for “anyone with ears” to hear, but it’s difficult to find the secret truth embedded within. The Kryptos sculpture was created as a work of public art, designed to decorate and, possibly, to celebrate the Central Intelligence Agency. It was not designed to keep secret information secret, it was meant to be decoded. This explains why it’s in public, not locked away in an underground vault. But why were Jesus’ parables told to the public and and his explanation, at least in this case, recorded in the Bible? He would have been able to keep his secret that much more secure by simply not telling the crowd in the first place. Just a couple verses after we left off, Jesus says “For there is nothing hidden, except to be disclosed; nor is anything secret, except to come to light” (Mark 4:22). Jesus does not, in fact, want to keep the gospel a secret – he wants it to come to light. He tells his secret parables in public so that the truth is in fact available, widely, for people to take for themselves. But not just anyone can find the truth in a parable. Only those who don’t want to look, but want to perceive; those who don’t just want to listen, but to understand; only those who don’t just want to be forgiven and go on their way, but want to actually become disciples are able to understand the parable, because they’re the ones willing to take the time to study it. Jesus’ concern isn’t that he wants to conceal the right answer from everyone but the disciples – his concern is that, if he were to give the “right answer” to the crowd, they’d take it for granted. The disciples, he knew, wouldn’t take the answer for granted – meaning, they would seek a deeper understanding of the answer Jesus gave them, not being satisfied with the “plain reading” of his words, but wanting to know more about Jesus’ teaching and why he chose to teach it to them. So how could Jesus solve this problem – that his disciples would use Jesus’ plain teaching to push them deeper into their relationship with him, but the crowds would use that same teaching to pull away from him, thinking they had learned everything they needed to? Jesus solved this problem by speaking ambiguously, in poetic language. He told all the truth, but he told it slant. And what do we imagine the result of this ambiguity would be? The same result that comes from any modern crowd hearing something ambiguous: everyone interprets its meaning differently for themselves. This, I believe, is exactly what Jesus wanted. God has a history of doing things like this! Think about the tower of Babel: God’s solution was not to knock the tower down, it was to give the people multiple languages to speak; a much more elegant solution. Think about Pentecost: the Spirit didn’t give the crowds the ability to understand Greek; the Spirit gave the disciples the ability to speak every different language spoken by the crowd! As much as God valued the chosen people of Israel, God also values diversity alongside unity of spirit. So when Jesus told the parable to the crowds, he was expecting them to interpret the parable in various ways – not to distract them from the truth, but to reveal multiple layers of truth within the parable. This is how the Bible works: each of its stories contains multiple facets of truth, each able to be discerned from a different perspective. The implications of this for church life and our individual faith journeys are huge! And to begin to understand them, we can uncover another grain of truth from the parable of the sower. In the parable of the sower, the seed that is sown is not an individual tree sapling – the seed is grain, many tiny plants each growing individually, sown widely. If this is supposed to represent the Word of God, then the Word is also not one single thing that lives or dies alone; it is sown widely, among many believers, each of which has to grow individually. Yet each of those individual plants grows in the same soil – and so each of us, as individual believers, needs to have fertile soil in which to grow. We need the Bible, we need the Church, we need the Spirit of Jesus within us. These things unite us together and enable the growth of the Word of God in our lives. Therefore, this theology of ambiguity is not saying “anything goes” – it’s simply saying that there’s more than one bit of truth in each of the stories of the Bible. There are certainly wrong ways to interpret scripture, but there are also multiple right ways. And this is part of the beauty of scripture! It’s infinitely applicable because it’s not a dead document, but a living one! Through it we encounter the living Jesus, who moves in our lives and has a relationship with us. And so we shouldn’t be surprised when that living Spirit of Jesus leads us to fresh understandings of scripture and new ways to be his disciples in the ever-changing world around us. So in my church, I never want to hear that it’s “my way or the highway” or “there’s only one way you can read this.” The Word of God grows like stalks of grain, not like a solitary oak tree. And it needs good conditions to grow! It needs soil free of rocks and thorns – free of distractions and obstacles to real, deep growth. Growing in faith means removing those rocks and thorns from my life. So if I want to be fertile soil, I have to be open to new ways of understanding scripture, rather than putting up obstacles that tell others “No! I’ve never heard it interpreted that way before!” The reality is that when we do that – shut ourselves off to growth in our understanding of scripture – we not only hurt our own faith, but we hurt the faith of others, especially when they bring new ways of understanding scripture to the table. But the more open we are to dialogue, conversation, and study about the Bible, the more fertile our soil will be, and the more able we will be to experience God in wonderful new ways. So when it comes to your faith in God – relax! We think we need hedges of thorns and walls of rock to keep our garden safe, but in reality, we need to be open to cross-pollination for any growth to happen in our lives. And this is the next step of discipleship: first to be sure of God’s love, then to be humble and committed to following Christ, and then to trust Jesus enough to open our minds to multiple ways of understanding the Bible and God’s work in our lives. And I’m completely convinced that God values multiple interpretations of scripture and tension between competing interpretations, because God has made the world to be an ambiguous place! If God wanted us all to know the truth about everything and be in perfect agreement, we wouldn’t need to do evangelism because God would be ruling the world with an iron fist and there wouldn’t be any way to argue about whether God existed. But that’s not how it is. We’re all grasping after truth together in our discipleship of Christ. So read your Bible. Take it seriously, because it contains the clearest revelation of God that we have today. Interpret it yourself, but bring your interpretations back to this community, and expand your horizons just as you expand ours. There aren’t many churches where that kind of collaboration is possible, but I’m doing my best to make this a place where everyone’s interpretation, right or wrong, can be shared with the community as we try to figure out how God is speaking to us. I think that’s more than valuable, I think that’s the only way that we can truly be disciples of Christ.